Today while attending the Conservatives International gathering in Miami, Senator Ben Murray Bruce of Nigeria praised the Castro regime's role in ending Apartheid in South Africa, of which I have to admit that I am skeptical of for reasons argued here before in this blog. Later on in the question and answer period I asked Senator Bruce if he was aware of the Cuban role in genocide in Ethiopia in alliance with later convicted war criminal Mengistu Haile Mariam. The Senator indicated that he had no knowledge of it, but that if someone did something good on Monday and something bad on Tuesday that he would celebrate what was done on Monday and condemn what was done on Tuesday. Fidel and Raul Castro were both deeply involved in sending 17,000 Cuban troops to Eastern Africa in order to assist Mengistu in consolidating his rule and eliminating actual and potential opposition. The last Cuban troops did not leave Ethiopia until 1989 and were present and complicit in the engineered famine that took place there. In 1990 traveling on a train through East Germany on my way to Prague I spent some time speaking with an Ethiopian economist who told me how Cuban troops would round up starving Ethiopian farmers when they got close to the cities, with grain stores, and drove them back out into the countryside to starve. Below are excerpts of some reports done on the Castro dictatorship's involvement in Ethiopia and links to the complete articles. I've highlighted the mention of Cubans in bold. The first excerpt is taken from the September 21, 1978 Rolling Stone article "Ethiopia After the Revolution: Vultures Return to the Land of Sheba" authored by Donald R. Katz. Toward the middle of last year , Mengistu pulled out all the stops. "It is an historical obligation," he said then, "to clean up vigilantly using the revolutionary sword." 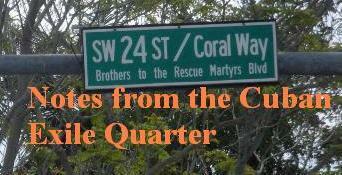 He announced that the shooting was about to start and that anyone in the middle would be caught in the cross fire. In what came to be known as the "Red Terror," he proceeded to round up all those who opposed the military regime. According to Amnesty International, the Dergue killed over 10,000 people by the end of the year. One anti-government party, mostly made up of students and teachers, was singled out as "the opposition." The Red Terror operated quietly and efficiently under the media cover provided by a vicious desert war that started when Somalia invaded eastern Ethiopia 10 months ago. Around this time, President Carter abandoned a long-term military agreement with Ethiopia on the stated grounds of "gross and systematic human rights violations," and Cuban soldiers and Russian arms poured in to protect and "consolidate the gains" of the revolution. By the time the Somalis were finally chased from Ethiopia's eastern front two weeks before I arrived, the politics of the revolution had been further obscured by Mengistu's determination to fight yet another war against secessionists in the country's northern province of Eritrea. After months of killing Ethiopian youth along with assorted Somalis and Eritreans, Mengistu declared to the world that the "anti-people forces who had lined us up for their lunch – we have had them for breakfast." Answering it would require broader examination of Castro’s Cold War record in Africa, to include the eastern regions of the continent, where Cuba intervened militarily on behalf of the Ethiopian dictator, Lt. Col. Mengistu Haile Mariam, in the 1970s. Mengistu participated in a successful military coup against the U.S.-backed Emperor Haile Selassie in 1974, eventually seizing power on Feb. 3, 1977,by massacring his rivals in the officer corps. 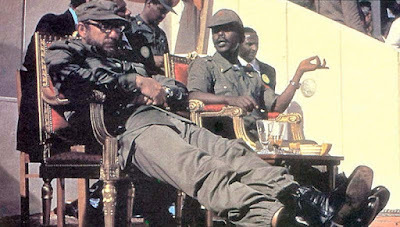 Castro admired this bloody deed as a preemptive strike against “rightists” that showed “wisdom” and cleared the way for Cuba to support Mengistu “without any constraints,” as he explained to East German dictator Erich Honecker in an April 1977 meeting whose minutes became public after the fall of European communism. [...] With the Cuban forces watching his back, Mengistu wrapped up his bloody campaign of domestic repression, known as “the Red Terror,” and sent his own Soviet-equipped, Cuban-trained troops to crush a rebellion in Eritrea. 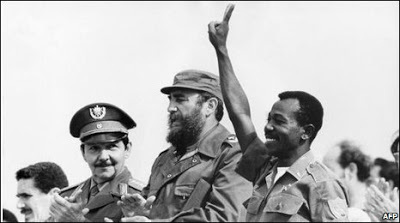 The last Cuban troops did not leave Ethiopia until September 1989; they were still on hand as hundreds of thousands died during the 1983-1985 famine exacerbated by Mengistu’s collectivization of agriculture. There is also video footage of the Castro regime's involvement in Ethiopia along with the testimony of victims. Fidel and Raul Castro's comrade, Mengistu was found guilty of genocide on December 12, 2006, and was sentenced to life in prison in January 2007. He was sentenced to death in absentia on May 26, 2008 following an appeal. Mengistu currently resides in Zimbabwe under the protection of African despot Robert Mugabe. This chapter of the Castro regime's involvement in Ethiopia should not be forgotten when discussing the Cuban presence in Africa. Thank you I am British but am married to an Angolan. So two things interest me, I am in favour of UNITA in Angola, and here in the UK I criticise Jeremy Corbyn. Corbyn defended Castro's 'defence' of Angola. I do not believe he is so stupid as to believe this himself. A second thing I could say was Castro did not help end apartheid. Apartheid ended because we no longer needed them to fight communism for us, they kept communism contained in Africa and went into battle often outnumbered four to one and really we all them a great debt. Whatever their racist policies were at home. But that is why apartheid ended, we won the cold war and no longer needed them.